The following report was released by the U.N. on December 1, 2015. 1. 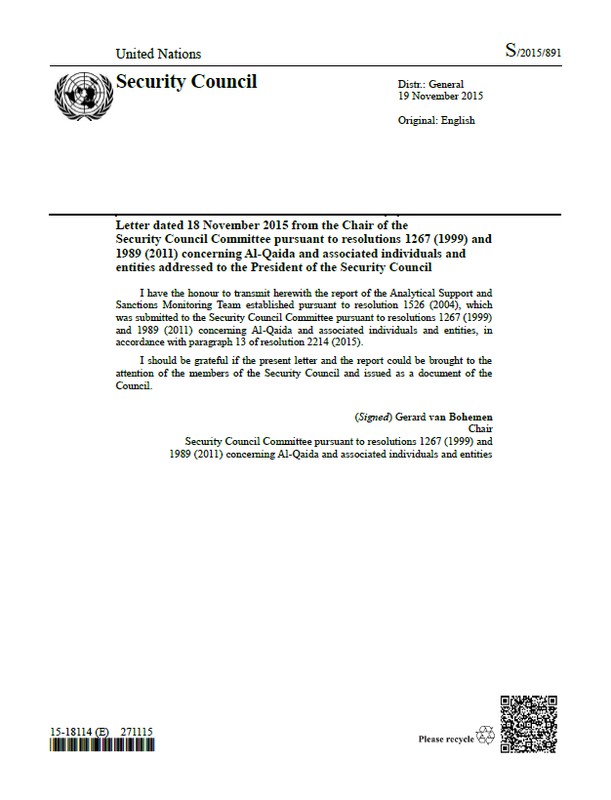 The current political and security challenges in Libya present an opportunity for groups associated with Al-Qaida (QDe.004), such as the Islamic State in Iraq and the Levant (ISIL), listed as Al-Qaida in Iraq (QDe.115), Ansar al Charia in its various reiterations, the Organization of Al-Qaida in the Islamic Maghreb (AQIM) (QDe.014) and Al Mourabitoun (QDe.141) to opportunistically exploit and complicate an already difficult situation on the ground. 2. While Ansar al Charia Derna (AAD) (QDe.145) and Ansar al Charia Benghazi (AAB) (QDe.146) seem to have weakened since the establishment of ISIL in Libya, AQIM, Al Mourabitoun and Ansar Al Shari’a in Tunisia (AAS-T) (QDe.143) continue to use the country as a rear base for their operations in the region. The leadership of ISIL recognized the situation in Libya as an opportunity to establish a new foothold outside its current area of control in Iraq and the Syrian Arab Republic. 3. The financing of groups in Libya that are associated with Al-Qaida seems sufficient to sustain their operations for now. However, ISIL operations in Libya do not generate revenue, nor are they currently organized, to the same extent as its operations in Iraq and the Syrian Arab Republic. 4. Since 2013, the country has experienced several waves of Libyan returnees, which also formed the backbone of the newly established ISIL in Libya. In addition, the country continues to attract foreign terrorist fighters in significant numbers from North Africa. While currently concentrated in its stronghold in Sirte, ISIL could seek local alliances to expand its territorial control, also entailing the risk of motivating additional foreign terrorist fighters to join the group in Libya. 5. Groups associated with Al-Qaida procure arms and ammunitions from the thriving domestic illicit arms trade and are not yet strategically dependent on outside supplies. The increase in the use of improvised explosive devices and the increasing number of suicide attacks are areas of concern. 6. It is the assessment of the Team that the threat associated with Al-Qaida in Libya is intimately connected to the continuing political and security challenges. Groups associated with Al-Qaida have established a significant presence in Libya, including facilities for training, implying a longer-term strategic goal to sustain a presence in the country (with external operations capability). The resulting threat is regional and international, with particular significance for Africa, given the growing numbers of foreign terrorist fighters and the presence of a globalized group of terrorists from different Al-Qaida backgrounds. 7. The pronounced rivalries between groups in the Syrian Arab Republic and Iraq that are associated with Al-Qaida, for example, the Al-Nusrah Front for the People of the Levant (QDe.137) and ISIL, are currently not yet replicated with the same ferocity in Libya. For example, while groups are competing for influence and resources in some regions of the country, they are able to cooperate if this serves their interest. 8. ISIL is an evident short and long-term threat in Libya. The group is benefiting from the “appeal” and notoriety of ISIL in Iraq and in the Syrian Arab Republic. However, the group’s threat should be realistically assessed. ISIL is only one player among multiple warring factions in Libya and faces strong resistance from the population, as well as difficulties in building and maintaining local alliances. Nevertheless, ISIL has clearly demonstrated its intention to control additional territory in Libya. This is a concern, given the country’s strategic location as a transit point within the region, control of which would enable groups associated with Al-Qaida, including ISIL, to further influence various ongoing conflicts in North Africa and the Sahel, in addition to offering a new hub outside ISIL-controlled territories in the Middle East. 19. Libya is strategically important for ISIL, in view of its geographical location at the crossroads between the Middle East, Africa and Europe. Owing to the current political and security challenges the country faces, resulting in a weakened national security apparatus, the country is also viewed as a potential retreat and operational zone for ISIL fighters unable to reach the Middle East. The ISIL central command in Iraq and the Syrian Arab Republic views Libya as the “best” opportunity to expand its so-called caliphate. Abu al-Mughirah Al Qahtani, the so-called delegate leader of the ISIL Libyan Wilayat, stated in a recent interview that “Libya has a great importance because it is in Africa and south of Europe. It also contains a well of resources that cannot dry. […] It is also a gate to the African desert stretching to a number of African countries”. Libya’s importance for ISIL has also been reflected in Abu Bakr al-Baghdadi’s (QDi.299) appointment of close aides to lead ISIL in Libya, including Wissam Al Zubaidi (alias Abu Nabil Al Anbari), Turki Mubarak Al Binali (alias Abu Sufian) and Abu Habib al-Jazrawi. 20. Several Member States highlighted the “unique” position of ISIL in Libya among the group’s other affiliates. It is the affiliate with the closest connection to the “centre” in Iraq and the Syrian Arab Republic. While several pledges of allegiance to ISIL by groups in the Middle East and Africa have not translated into concrete outreach and cooperation, ISIL in Libya has thus far been the only known ISIL affiliate that has benefited from support and guidance by ISIL in the Middle East. The pledge of allegiance by the local affiliate of ISIL in Libya in September 2014 was organized in the presence of emissaries sent by Al-Bahgdadi. Abu al-Bara al-Azdi, a Yemini national, and Al-Jazrawi, a Saudi national, travelled to Derna for that purpose. Al-Baghdadi also dispatched the Bahraini preacher, Turki Al-Binali, a member of the ISIL religious council, to Libya in 2013 and 2015. Soon after Binali’s first visit, a wave of foreign terrorist fighters arrived in Libya from the Maghreb, Egypt, Yemen, the Palestinian territories and Mali. 21. This close relationship between ISIL in Iraq and the Syrian Arab Republic and ISIL in Libya is also based on two additional elements. First, a significant number of Libyan nationals (around 800) fighting with ISIL in Libya had previously fought with ISIL in Iraq and the Syrian Arab Republic. Those fighters have only relatively recently returned to Libya and still maintain close relationships with their contacts in Iraq and the Syrian Arab Republic. Second, ISIL in Iraq and the Syrian Arab Republic continues to send emissaries with instructions, albeit infrequently, to ISIL in Libya. The travel of these emissaries distinguishes the ISIL affiliate in Libya from other ISIL affiliates where travel of emissaries has not been reported. 22. ISIL in Libya was created by a core of Libyan returnees from the Syrian Arab Republic, who, when in the Levant, created Al-Battar Brigade in 2012 to support ISIL in the Syrian Arab Republic and Iraq. Many of its members returned to Libya in the spring of 2014, where they reorganized in Derna, under the banner of the Islamic Youth Shura Council (IYSC). In October 2014, IYSC pledged allegiance to ISIL and declared eastern Libya to be a province of the so-called “Islamic state”, calling it “Wilayat Barqa” (the Cyrenaica Province). 23. According to the ISIL magazine, Dabiq, ISIL in Libya has been placed under the leadership of Abu al-Mughirah Al-Qahtani, described as the “delegated leader for the Libyan Wilayat”, which could correspond to the most senior ISIL position in Libya. Al-Qahtani, whose name seems to originate from the Arabian Peninsula, has not been mentioned in past ISIL propaganda. Furthermore, the Monitoring Team has not received Member State confirmation that he is in Libya or that he is leading ISIL in the country.